My husband loves to say that we have an Amazon package delivered to our doorstep everyday, but I like to think he is being a tad dramatic. LOL. I know I cannot be the only one that has the Amazon bug and buys pointless necessary things in the matter of minutes. It’s dangerous, but I am loving it. Since we recently moved into our new home, I have not been wanting to leave it. Hint why Austin thinks we are getting pacakges delivered daily, because maybe we are. HA. And not leaving the house comes all things Amazon. 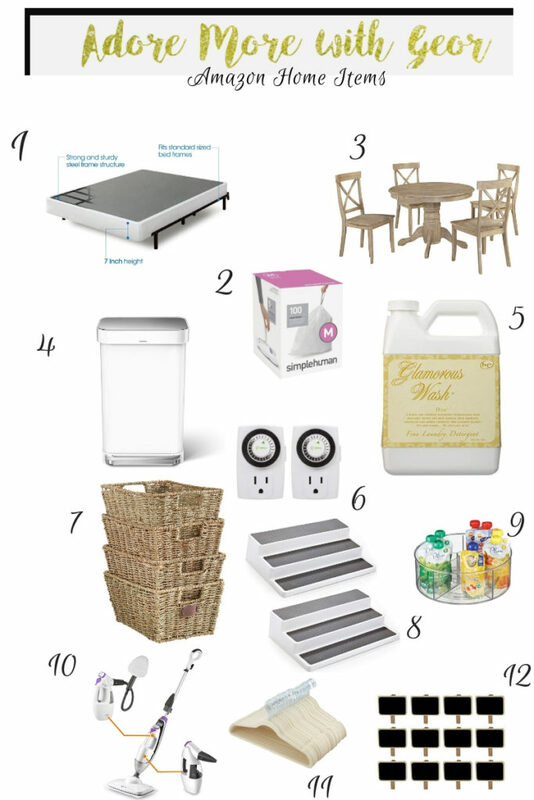 Today I wanted to round up some of the home items we have purchased. 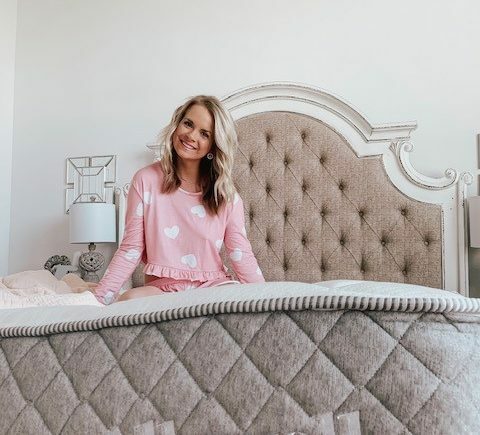 Now you may be thinking some of these items, like the box spring, are pointless, but I have heard from a ton of girls that are also moving so hopefully this helps! King Size Box Spring- so we purchased a new king size bed/mattress and majorly needed a box spring and this affordable one from Amazon is great! It was super easy for Austin to put together and gives our bed the perfect height. We went with the 7 inch, but there are other heights to fit your bed necessities. Simple Human Trash Bags- again, so random, but the fact that I can easily order 100 of these for $30 bucks is awesome. Trash bags are one thing I hate running out of! 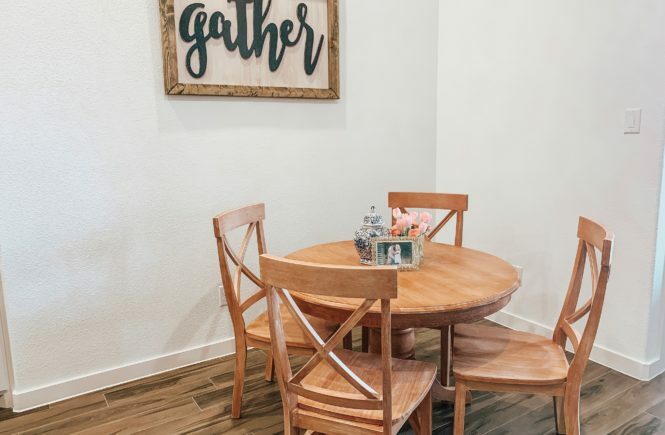 Kitchen Table- you have probably seen this on my stories and most likely wouldn’t have guessed that it came from Amazon! 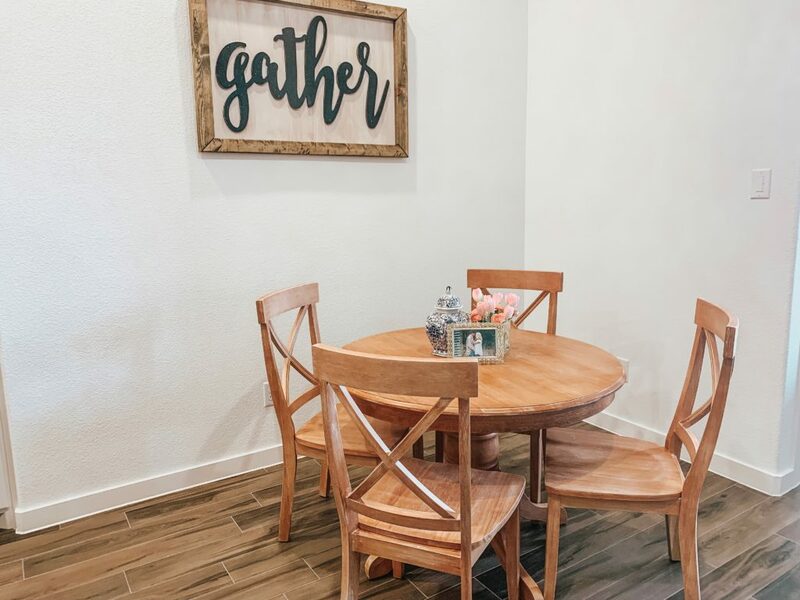 We searched and searched for the perfect addition to our tiny dining space and this does just the trick. I love the whitewash color because it can fit the scheme of any house! Simple Human Trashcan- I never knew I could love a trashcan so much, but here I am. Extremely worth the splurge, as it looks nice and clean in our kitchen and it has a compartment for the extra trashbags. Super convenient if you ask me! My mom even has the silver one in this version and she loves it just as much. Glamorous Wash- the best detergent ever. It’s pricey, but I use it strictly for towels and sheets, and it leaves them smelling heavenly. A little trick is to just pour a little in a white fabric softener and it goes a long way! Outlet Timers- if you follow along on Instagram I can almost guarantee you have seen me talk about these. We use them on the lamps in our room to help us get up bright and early. Trust me, it works! Baskets- I love these for storage in our laundry room and pantry. These plus number 12 on the list make my type A heart happy! And $40 for 4 is a pretty good price for nice looking baskets. Risers- you can use these in your pantry for cans or even for spices. Helps you see everything you have + leaves your pantry looking so organized! Lazy Susan Organizer- I particularly use this in our pantry to store pastas and random items, but it would also be great under a bathroom sink for all of your beauty items! Steam Mop- I love this mop so stinkin’ much! Let’s be real, who actually enjoys mopping? No one, but this mop makes it so easy and is mess free. It gets the job done fabulously! Velvet Hangers- I majorly needed to get rid of all of our ugly hangers and make our closet look more organized and “cleaner.” While it is a work in progress, we are slowly getting there. This set is super affordable and comes in multiple colors! Basket Labels- perfect to pair with item number 7 and label what each basket has in it.